In an America where the rich and fortunate have free rein to do as they please, can the ideal of liberty and justice for all be anything but an empty slogan? Many Americans are doubtful, and have withdrawn into apathy and cynicism. But thousands of others are not ready to give up on democracy just yet. Working outside the notice of the national media, ordinary citizens across the nation are meeting in living rooms, church basements, synagogues, and schools to identify shared concerns, select and cultivate leaders, and take action. Their goal is to hold big government and big business accountable. In this important new book, Jeffrey Stout bears witness to the successes and failures of progressive grassroots organizing, and the daunting forces now arrayed against it. Stout tells vivid stories of people fighting entrenched economic and political interests around the country. From parents and teachers striving to overcome gang violence in South Central Los Angeles, to a Latino priest north of the Rio Grande who brings his parish into a citizens organization, to the New Orleans residents who get out the vote by taking a jazz band through streets devastated by Hurricane Katrina, Stout describes how these ordinary people conceive of citizenship, how they acquire and exercise power, and how religious ideas and institutions contribute to their successes. 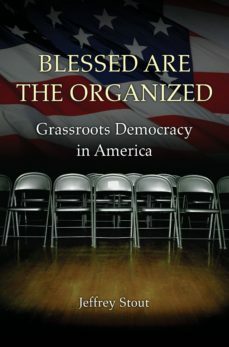 The most important book on organizing and grassroots democracy in a generation, Blessed Are the Organized is a passionate and hopeful account of how our endangered democratic principles can be put into action.